Several breeders, a few pet owners and I pooled data from weighing our male and female puppies from different bloodlines for a whole year. The chart won't fit on the page right, so in order to render it so that the graph displays the lines correctly, click on the chart. It will open in a new window. It was interesting to see the mini-surge during the first half of the year (months 2.5 to 5 ) and then all of the puppies leveling off to slower growth rates at some point after seven months. Not all the datapoints are charted above (for sake of clarity) and a few owners never took the weights at one year. The surge patterns seem obvious. Of course not everyone was able to take weights on their pups as frequently as some others (these guys were getting heavy!) 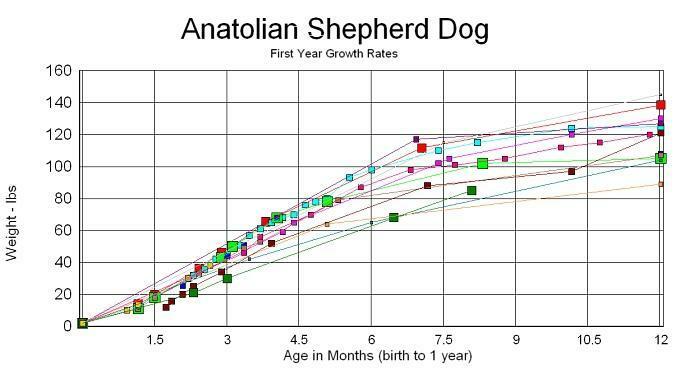 but hopefully this chart may provide some information for a new owner who is wondering about their pup's growth rate. Also helps us understand the periods of increased stress (and potential for HOD and Pano) that occur during these growth stages. Puppies a little more refined or lighter in bone had somewhat steadier growth and did not have the same degree of rolling surges of rapid growth as those pups whose supporting muscle and bone had to develop a lot faster to keep up with their degree of bulk. 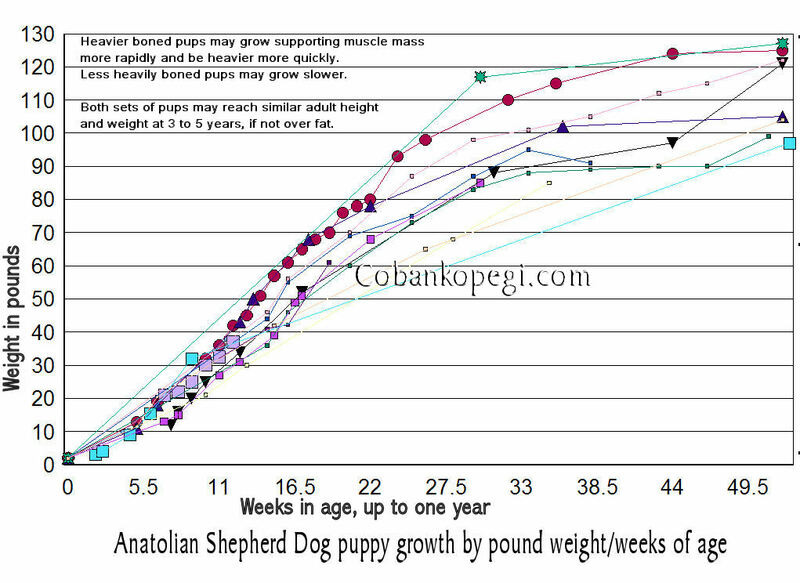 A year after all this weight plotting, the pup's weights at two years are generally 8 to 15 pounds heavier than the weights at one year (at least the ones I know which are not obese). And they're still not fully mature. :) Males reach some impressive magnificence at five years of age. The very heaviest and the lightest pups on the chart at one years age are males from very different bloodlines. Females and males are scattered throughout the chart. Jul 15, 2009: Update with a similar but larger chart I had floating around.